This completes a two-part memoir of the author’s grandfather, John Matthew Tompkins (“Poppy”), longtime superintendent of the Croton Aqueduct gatehouse in Yorktown. Part one was in the Winter 2006/07 newsletter, no. 25. A few years later, on October 14 and 15, 1955, a major hurricane moved through the region, depositing enormous amounts of rain on a saturated valley. 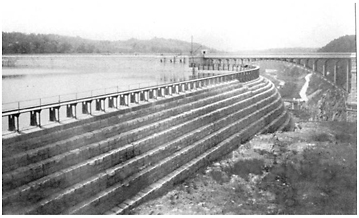 The Croton Reservoir was already at capacity, which in those years included the potential for additional impoundment from a system of wood planks that could be dropped into slots via a hand-powered rail system that extended across the spillway. The surge in runoff was so extreme after the storm that water supply workers were amazed to see the reservoir’s normally still water flow past the gatehouse as if it were a slow-moving river, and the spillway’s customary lacy overflow transformed into a wall of water. According to my grandfather and father, the reservoir reached a level never before and never again achieved. John M. Tompkins took his son, John Roger, and went to the dam to check on its status. As they entered the bowels of the masonry structure, they had trouble steadying themselves against the amazing vibration of the dam. Poppy tried to read the gauge that measured the flow of water, but it was not working. He leaned out an opening in the dam to attempt a measurement using a tape measure, but came back in, white with fear from the vibration in the masonry. Against the overwhelming roar of the spillway, Poppy yelled to his son that they needed to get out because he was unsure if the structure would hold – this from a man who knew the dam and its capacity like the back of his hand. Sure enough, the dam did crack in numerous places and required draining the reservoir to complete extensive repairs, which included removing the structure along the length of the spillway that had permitted additional impoundment. Current plans for the dam’s modernization include studying the possibility of raising the normal water level up to four feet. Poppy’s life was the Croton Reservoir and the Croton Valley. He was the one who found a trove of nineteenth century photos of the construction of the dam that were in a dumpster and saved them for posterity. He was heartsick to see the deterioration of the Dam Plaza in the 1970s, and saddened by the choice of the simple arch bridge that replaced the ornate original bridge from the 1906 completion. After retirement, he had to watch his “home” of 40 years deteriorate from neglect, prior to its use as a Department of Water Supply (now New York City Department of Environmental Protection) police station. My own childhood tour of the gatehouse in 1971 was, in many ways, Poppy’s final attempt to continue the deep cultural connections between his family and the Croton Valley. When I was too fearful to enter the interior of the structure, he took me outside to view the enormous pipes heading up the rock face and off to New York City. We walked up Arcady Road to look down on the dedication plaque for the 1842 Croton Dam and Aqueduct entrance. Poppy then had me dip a fishing line into the water by the intake at the gatehouse. Legally, this was not allowed, but it was a special treat as he approached retirement and, after all, everyone knows that the bass love those granite-faced walls by the gatehouse! After his death in 1972 as a result of complications linked indirectly to the chlorine tank incident, I often thought of my day with Poppy. I grew up in Croton Heights, so named because in the eighteenth century one could view the Pine’s Bridge crossing from historic Davenport House. Before we used air conditioning, we would spend summer evenings sitting on the porch. The cool night air carried many sounds – the fire whistle from Katonah, the train whistle from the Harlem Line rail crossings, and the Thunder Bridge at the gatehouse. Until the wood on the bridge was replaced with metal grates in the 1980s, that sound was a constant reminder of my grandfather, his connection to the Croton Watershed, and my cultural heritage as a son of the Croton Valley.